Our 25+ years of experience guarantees quick and efficient turnaround on any restoration or refinishing project. Kitchen Cabinet Painting is a great way to bring life back into your kitchen. Customers today have several choices of finishes and a broad range of colors for their cabinets when considering painting. White is our most requested color, but many also choose a designer inspired color such as black or gray or some other color that speaks to them about their space. 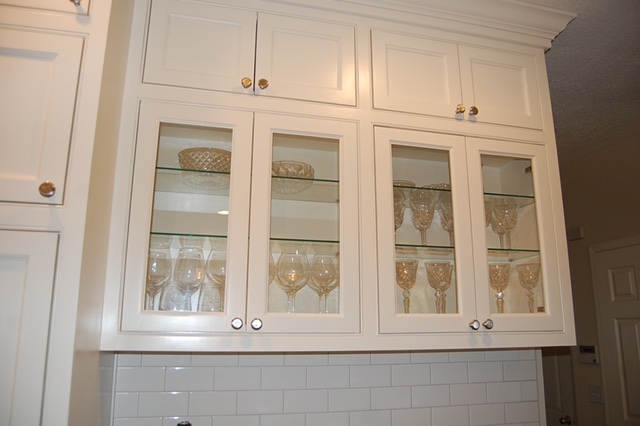 The painting process begins with the overall evaluation of your cabinets including items such as the current finish application and the preparation process needed to ready these the surfaces for painting. We will help you determine a recommended course of action and a product that is compatible with the surface of your cabinets. Also we take into account the level of quality, durability, service cycle, and items such as ease of cleaning and maintenance. Customers can expect dedicated hand labor surrounding both the removal and installation of attached hardware items such as knobs, pulls, hinges, latches, drawer fronts and doors. All of these items need to be removed, marked and accounted for so they can be returned to their correct location when the painting process is complete. The entire cabinet “Box” must be masked & sealed to prevent paint from entering the interior areas and contacting shelving and finished areas inside the cabinet box. Often our painting process dictates we remove the doors and drawer fronts and finish these items off site in a more controlled shop setting. Onsite painting and finishing occurs to the non-removable wall and base cabinets after careful masking and preparation of areas such as floors, walls, trim, counter tops, and ceilings. Rooms such as kitchens will need to have a sealed area established and remain in place during the painting and preparation process. The actual paint process is a hand labor intensive process and includes cleaning, sanding, filling, priming, sanding again, painting (at least 2 coats) and a cure time prior to use. Cure times vary, and are important to the overall process as the finish needs to harden or cure before use so the finish is not damaged. We then carefully remove and dispose of the masking materials at the end of the job. The end result is a beautiful, revitalized kitchen. Ready for years of service and lasting enjoyment.